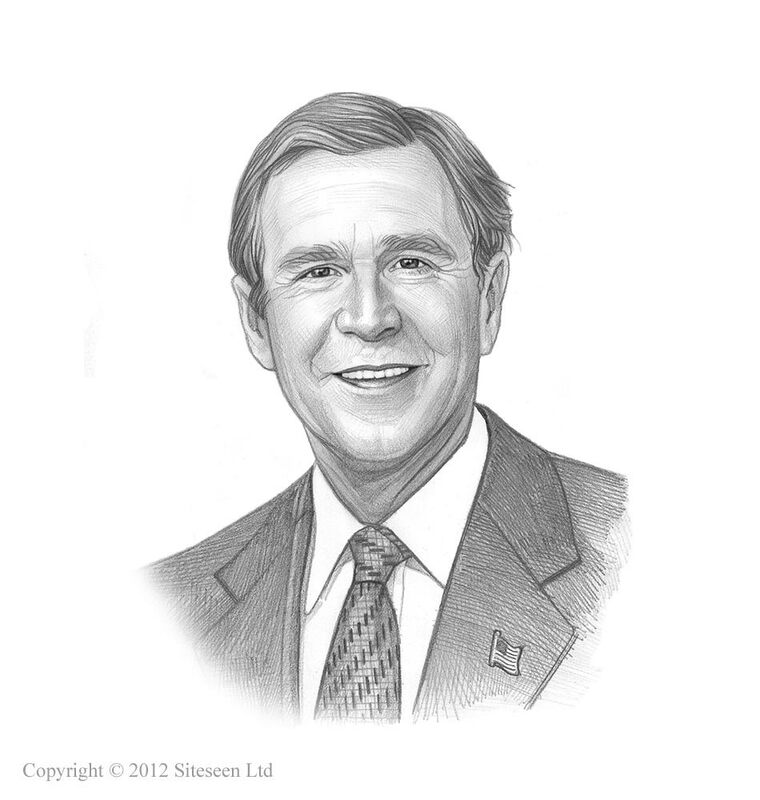 9/11 Terrorist Attacks: George W Bush was the 43rd President who served in office from Jan 20, 2001 to Jan 20, 2009. One of the important events during his presidency were the 9/11 Terror Attacks. Summary and definition: The 9/11 Terror Attacks of Tuesday September 11, 2001, were perpetrated by four coordinated groups of radical Islamic suicide bombers who hijacked planes on domestic flights in the United States with the intention of crashing them iconic American landmarks that represented key government, military and financial institutions. Flight 175 crashed into the South Tower of the World Trade Center in New York City, Flight 11 crashed into the North Tower of the World Trade Center and Flight 77 crashed into the Pentagon. Flight 93 aimed at the White House, was thwarted by a passenger revolt and the plane crashed in a field in Pennsylvania. The 9/11 Terror Attacks resulted in the deaths of over 3000 people and were masterminded by the terrorist group Al-Qaeda, led by Osama bin Laden. Where did the 9/11 Terror Attacks take place? The 9/11 Terror Attacks took place at the Twin Towers World Trade Center in New York and the Pentagon in Arlington County, Virginia. A hijacked plane, United Airlines Flight 93, crashed in a field in Somerset County, Pennsylvania, was believed to have been intended to crash into the White House. Who was behind the 9/11 Terror Attacks? The coordinated 9/11 Terror Attacks were carried out by members of the radical Islamic group Al-Qaeda, but the man behind the 9/11 Terror Attacks was Osama bin Laden. Why did the 9/11 Terror Attacks happen? Osama Bin Laden had declared a fatwah advocating the killing of Americans, including civilians, anywhere in the world. The targets of the 9/11 Terror Attacks were iconic American landmarks representing key government, military and financial institutions. The following fact sheet contains interesting facts and information on 9/11 Terrorist Attacks. Osama bin Laden had risen to prominence as the leader of the radical Islamic group called Al-Qaeda. In 1998 Osama Bin Laden had declared a fatwah (death sentence) advocating the killing of Americans, including civilians, by Muslims, anywhere in the world. Following the Fatwah, the United States embassies in Kenya and Tanzania were bombed by Al Qaeda in 1998, and in 2000 crashed a boat, loaded with explosives into the USS Cole, killing 17 American sailors and injuring another 39. On September 11, 2001 terrorists attacked America. Four planes were hijacked by Al-Qaeda suicide terrorists, determined to commit mass murder. Two (American Airlines Flight 11 and United Airlines Flight 175 headed for the twin towers of the World Trade Center, American Airlines Flight 77 headed for the Pentagon and the fourth, United Airlines Flight 93, was intended for the White House in Washington D.C. The 9/11 Terror Attacks shocked the world and were the most devastating terrorist attacks on the US homeland, killing over 3000 people and injuring over 6000 people. Flight 11: Mohamed Atta & Abdulaziz al-Omari boarded a domestic American Airlines Flight 11 to Los Angeles, California as part of the 9/11 terror attacks. There were 81 passengers, including a total of five hijackers and 11 crew members. Flight 11: The hijacked plane headed for their target - the North Tower of the World Trade Center, Manhattan, New York City. 2 flight attendants were stabbed by the hijackers and flight attendant Betty Ong alerted American Airlines and air traffic control realized Flight 11 had been hijacked. Flight 11: At 8:46am Flight 11 crashes into the north face of the World Trade Center, between floors 93 and 99. The crash is witnessed by countless people in Manhattan and the incident is transmitted via TV believing the crash was a terrible accident. Flight 175: Americans realized the first crash was no accident as a second hijacked plane, Flight 175, slammed into the South Tower at 09:03am. There were 56 passengers, including a total of five hijackers and 9 crew members. Flight 175: The crash of Flight 175 was seen live on television around the world as it happened as people looked aghast at the site of the twin towers billowing with smoke and fire and realize that America is under attack by terrorists. Fire fighters rush to the scene of the disaster and, as the evacuation of the buildings begin, bravely start to climb the massive towers in attempt to rescue the trapped people. Flight 77: At 09:37am the crashed into the western side of the Pentagon in Arlington County, Virginia. There were 58 passengers, including a total of five hijackers and 6 crew members on the hijacked plane. Flight 77: Every person on the hijacked plane was killed and 125 people died in the Pentagon. Flight 93: At 9:28am Hijackers stormed the cockpit on Flight 93 and divert the plane towards the White House in Washington D.C. There were 37 passengers, including a total of four hijackers and 7 crew members. Collapse of the Twin Towers: The South Tower collapsed at 9:59 am and at 10:28am the north tower of the Twin Towers World Trade Center collapsed exactly 1 hour, 41 minutes and 45 seconds after the impact of Flight 11. The Marriott Hotel, located at the base of the Twin Towers, was also destroyed. A massive cloud of dust and debris covered the area surrounding the site of the Twin Towers and New Yorkers run for their lives. At 11:02am New York City Mayor Rudolph Giuliani takes control in New York urging New Yorkers to stay at home and orders an evacuation of the area south of Canal Street in Lower Manhattan. At 02:00pm President Bush puts the U.S. military on high worldwide alert and the National Guard leave their civilian jobs and report for duty. President Bush says "Make no mistake, the United States will hunt down and punish those responsible for these cowardly acts..."
At 05:00pm the City of New York announces that 200 fire-fighters have been killed and 78 police officers are missing. A frantic search for survivors of the Twin Towers bombing will continue for days. At 6:54pm President Bush arrives back at the White House aboard Marine One. He addresses the nation at 08:30pm and asks for prayers for the families and friends of the victims of the terrorist attacks. The president declares that "These acts shattered steel, but they cannot dent the steel of American resolve" and that "...the U.S. government will make no distinction between the terrorists who committed the acts and those who harbor them..."
At 11:30pm: President Bush makes the following entry in his daily journal: "The Pearl Harbor of the 21st century took place today...We think it's Osama bin Laden." The bright, sunny day that had dawned on Tuesday September 11, 2001 ended in grieving and anger as the lives of Americans changed forever. On September 14, 2001 President Bush declared a national emergency and Congress voted to authorize the use of force to fight the terrorists. The Federal Bureau of Investigation (FBI) quickly identified the 9/11 Terror Attacks as the work of Al-Qaeda, the radical Islamic group headed by Osama bin Laden. Flight 175 (South Tower of the World Trade Center): The Hijackers and bombers of Flight 175 were identified as Marwan al-Shehhi, Fayez Banihammad, Mohand al-Shehri, Hamza al-Ghamdi and Ahmed al-Ghamdi. Flight 11 (North Tower of the World Trade Center): The Hijackers and bombers of Flight 11 were identified as Mohamed Atta (Seat 8D, the likely pilot), Waleed Alshehri (Seat 2B), Wail Alshehri (Seat 2A), Abdulaziz Alomari (Seat 8G) and Satam Al Suqami (Seat 10B). Flight 77 (Pentagon): The Hijackers and bombers of Flight 77 were identified as Hani Hanjour, Khalid al-Mihdhar, Majed Moqed, Nawaf al-Hazmi and Salem al-Hazmi. Flight 93 (Pennsylvania): The Hijackers and bombers of Flight 93 were identified as Ziad Jarrah (the likely pilot), Ahmed al-Haznawi, Ahmed al-Nami and Saeed al-Ghamdi. The 9/11 hijackers originated in countries across the Middle East. The majority came from Saudi Arabia but others came from the United Arab Emirates, Lebanon and Egypt. The United States Secretary of State Colin Powell began to build an international coalition to support America as Secretary of Defense, Donald Rumsfeld, began deploying troops to the Middle East. Osama bin Laden, believed to be hiding in Afghanistan, was the prime suspect in the 9/11 Terror and the United States demand the extradition of Osama bin Laden by his allies, the Taliban. The Taliban ignore the extradition request and on October 7, 2001 combined U.S. and British forces launch air strikes against terrorist targets in Afghanistan. The War on Terror had begun. President Bush proclaimed that "From this day forward any nation that continues to harbor or support terrorism will be regarded by the United States as a hostile regime". Following the 9/11 Terror Attacks the USA Patriot Act was passed on October 26, 2001 and the Department of Homeland Security became operational on January 24, 2003. The Freedom Tower, now referred to as the One World Trade Center (1WTC) was opened on November 3, 2014 as a symbol of the nation's commitment to rise above the 9/11 terror attacks, establishing a new architectural landmark and icon for New York city.